In a 4-quart Dutch oven cook pasta following package directions, adding the broccoli the last 3 minutes of cooking. Drain. Return to hot pan. 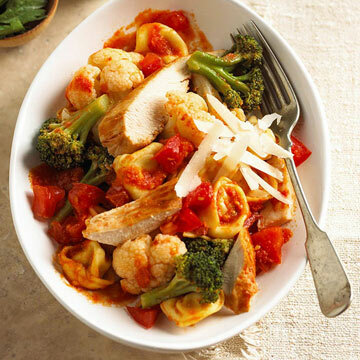 Stir chicken, undrained tomatoes, and pesto into pasta. Cook just until heated through, stirring occasionally. If desired, sprinkle with Parmesan cheese. Makes 4 servings.